The National Agroforestry Center has developed a number of publications that describe the role agroforestry can play in supporting pollinators. “How can agroforestry help pollinators?” is a two-page information sheet that highlights opportunities to recognize, protect, and enhance pollinator habitat. “Working Trees for Pollinators” is a six-page color brochure that illustrates important pollinators for food production and how agroforestry practices can be adapted to meet the needs of both pollinators and producers. 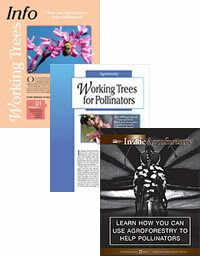 The recent issue of the Inside Agroforestry newsletter is titled “Learn How You Can Use Agroforestry Help Pollinators”. Visit the National Agroforestry Center’s Agroforestry Notes and Pollinators web pages for more information about pollinators and agroforestry. 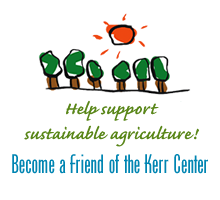 Anyone who’s attended a Kerr Center horticulture workshop in the last umpteen years has been exposed to the idea that crop rotations confer numerous benefits both on the soils they’re carried out on, and on the crops that grow in those soils. Studies hot off the academic presses have just added more support to the notion. Videos of several presentations from the January 2016 Southern Soil Health Conference in Ardmore are now available for viewing free online.